Do you love science but can’t quit your day job? Be a weekend warrior for science! Citizen science, also known as crowd-sourced science, is a way for the general public to help scientists in their research. No fancy science degree required, just an interest in science and sometimes a bit of training. The available projects range from interpreting historical literature (Science Gossip) to classifying galaxy shapes (Galaxy Zoo) to reporting Harmful Algal Blooms (Water Reporter) and everything in between. Many projects lead to published papers or open-source databases. Citizen Science has been used in all areas of research, but especially in environmental science. Listed below are some ideas to get you started on your science quest. ICPRB is looking for volunteers to report Harmful Algal Blooms in the Potomac river watershed using a newly developed smartphone app. Casey Trees in the District of Columbia has several opportunities, including a phenology study and a tree inventory. 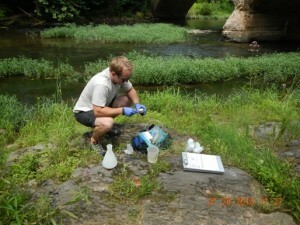 The Audubon Naturalist Society offers classes for their citizen scientist water quality monitoring program. If you are interested in the health of your local stream, the Audubon Naturalist Society (ANS) has an app for that! The Creek Critters app will walk you through finding and identifying macroinvertebrates. After submitting the data, the app will produce a Stream Health Report and send the data to ANS. The Trash Free Potomac Watershed Initiative uses data from trash pick-up events to track trends in the watershed. Virginia Working Landscapes is looking for assistance with plant, bird, and pollinator surveys. Join the DC/Baltimore Cricket Crawl each August and help map the distribution of insects in our area. Looking to get your kids excited about science and the natural world? PBS SciGirls is a great resource for projects geared towards science warriors-in-training. You can also satisfy your inner science-geek by becoming a certified Master Naturalist. Many naturalist programs include a citizen science component. Check out your state’s program for more information. Do you know of a citizen science opportunity in the Potomac river basin? Let us know!